You're invited to a special event hosted by PWC, we're bringing men and women together of all backgrounds to create a movement, where we open the floor to have difficult conversations that empower, encourage and inspire both genders. Come join us and be a part of the engaging conversations to raise awareness of men, mental health, marriage, mindset, money, and mates by creating a safe space to discuss, share knowledge, break our barriers and ultimately progress in life. We've designed a unique new format, which encourages collaboration and is designed to address the issues facing men and women in today’s fast-paced world. In the aim of pushing through the rooted challenges that stop us from reaching our full potential in all areas of our lives. In addition, we want to engage with you, the audience and we want you to be apart of the conversation, thus we will listen to your questions, and fresh perspective on the topics, whilst connecting with new like-minded professional and have an enjoyable afternoon. Together let’s give each other a hand to grow, evolve and create solutions with a practical way forward. Be proud to play your part of a movement, and a community that says, "it’s ok not to be ok… and we are here, ready and willing to help". Men - Let's talk about the conversations that we're not having and how can we as a collective make it easier for them to be talked about, free of judgment and criticism. Mindset - Before we do anything, what is the mindset we need to approach the challenges that affect us? Mental health - Why are we so afraid of talking about how we feel, do we even know how we're feeling? What can we do as a collective to make it easier for others to talk? Marriage – Is it time to take ownership of your part in a partnership & union called 'marriage'? Why is communication, self-awareness, empathy, compassion, personal development and love so important in a marriage? Money – What would you do if you had no money? How do we break the barriers that make it easier for us to talk about our money, manage our money and breakthrough our limiting beliefs and develop a healthy relationship with money? Mates - How do we surround ourselves with people who challenge us, accept us and allow us to grow? What does it mean to be a good friend? How can we be better friends to those in our lives? How we can be better together? Our purpose is to create a relaxed atmosphere for men and women to share their challenges, accomplishments, and journey, whilst connecting with new people. A place where your journey is appreciated, celebrated and your views are respected. There will be transformational talks with guest speakers sharing their extraordinary stories, and secrets around key topics. Also, we believe we are ‘better together’, so we're not leaving you out. 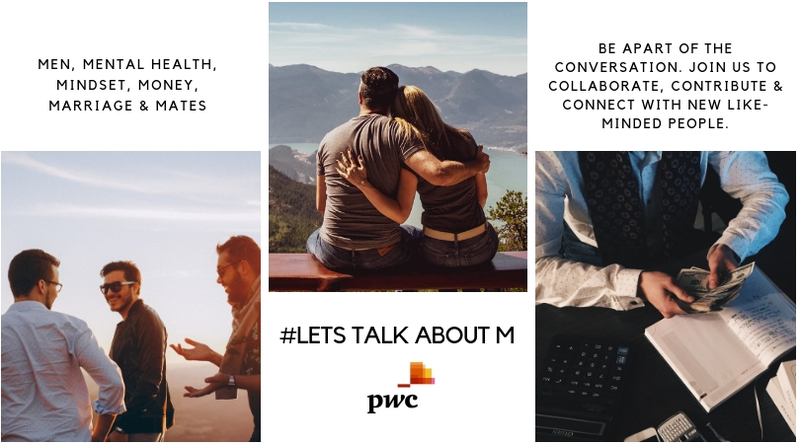 You will be in teams to get involved with our Let Talk About M challenges, where you get to share our story, connect with new people and have an enjoyable afternoon. So, please feel free to invite a few mates that you know and let’s make this an event to remember. Here's a sneak peek of your host and speakers, including a glimpse of their stories. 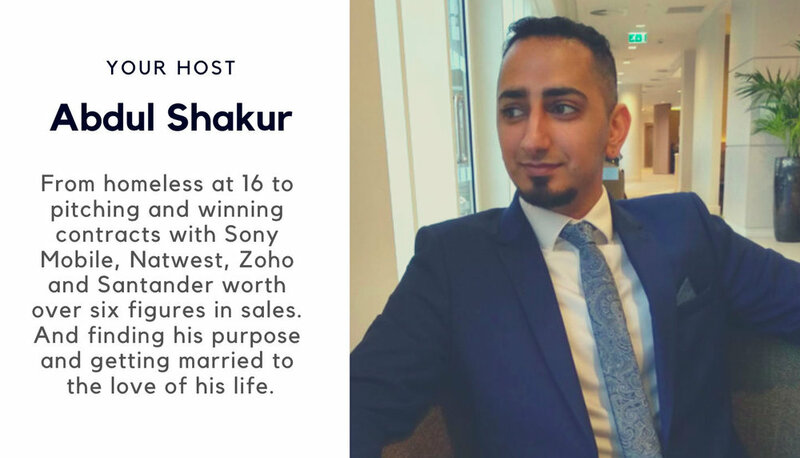 Abdul is an Award-Winning expert in sales has been awarded several accolades, including the top 20 most powerful young entrepreneurs in the world. He's pitched and won contracts with Sony Mobile, Natwest, Zoho and Santander worth over six figures in sales. At the beginning of his career, he had to overcome cultural and societal norms due to taking the decision to drop out of college, and not pursue a career in medicine, law or accountancy but deciding to start a business. In addition, the pressures that came with being a young entrepreneur put him through depression and developed a growing lack of self-belief, which festered in other areas of his life. Furthermore moving from his hometown, Birmingham to London Abdul dedicated his life to his career, making money and yearned for affection from new friends, as he did not receive it from family. Thanks to his wife, Abdul discovered his purpose, balance, slowly got the help he needed and re-defining himself as a man, husband, and entrepreneur. Now Abdul looks to use his journey as a source of inspiration and is on a mission to build support networks with purpose and an active advocate for men's mental health awareness. As a Professional Therapist and Relationship Coach, who has worked with highly pressured professionals she provides transformative talking therapies to individuals needing to make a change in their lives, or want to help people discover these secrets for themselves. Sabian Muhammad is making a return to the speaking circuit after six years away from entrepreneurship education industry with a very hard-hitting message about entrepreneurship, mental health, and mindset. He experienced the highs of speaking in the House of Lords, running campaigns for O2, and co-founding an ent-education business to the lows of lack of self-belief, depression and perceived failures Sabian has a sobering message to share. He will share his personal story, lessons learned along the way and explain why understanding your mind is the most important and vital foundation for success. More recently the chair of the charity providing play services, a personal trainer and mindset adjustment coach, who encourages individuals to enjoy mental and physical development. She's an Award-Winning Qualified Marketing Expert and Business Mentor featured in Huffington Post, BBC and Pure London. Sarah Khan, as known as Sara K has lead marketing projects with global brands such as Volkswagen Group and more recently supported Architects, Corporate Directors, to Vice Presidents from some of the biggest organisations in the world, Google, Vivienne Westwood to Bank of America Merrill Lynch. Although it hasn't been smooth sailing, as over the years she's suffered from severe anxiety. At the beginning of her career, she was immersed in the face-paced marketing environment, where she received little or no training and to the frustration of managers, it soon turned into workplace bullying. Although, in every role, she remained resilient, determined and progressed to managing global projects and senior roles, without the official title and salary. As a result, she developed training projects to support marketing teams and quadrupling profits, whilst reducing staff turnover and moved on to start her digital marketing consultancy with a difference. Today Sarah uses her expertise to train professionals in digital marketing and mentor them to be successful in their careers, businesses and become the nurturing leaders the world needs in the 21st century. As a result of her ventures, Sarah has reached over 325 men and women from across the globe in 180 days. Alongside generating 20 million euros of sales revenue in his day job, Garry is an experienced learning and development professional. He is intrigued by unleashing people's untapped potential and focuses on awakening the 'innate brilliance that sits within individuals, leaders, and teams'. In the past, he's shied away from integrating into society due to his past experiences. When he was a teenager he was physically bullied and more recently mentally at work, in a previous role. As a result, it led to self-harming and was mentally challenging every day for him, all of which kept him as a closed book, until 2018. Today Garry's personal purpose is to help humanity live a life of purpose, free from fear and with the opportunity to learn every day. He's passionate about supporting every person bringing their 'whole self' to work and going home enriched to their family at the end of the week, through focusing on mindset, trust, curiosity, well-being, listening, purpose, values, and inclusion. Shalah works within PwC's Tax practice, with over 8 years of experience and joined the firm as a school leaver. Due to her own personal experiences with mental health, she wanted to address the challenges she had faced in the workplace but also the community she belonged to. As a result, she has since become a mental health advocate particularly for those from a minority or faith-based background. During her time at PwC, she has driven a number of D&I strategy initiatives and campaigns including driving forward PwC’s This is Me video released in April 2018 tackling the stigma from a faith and culture perspective. She also sits on PwC’s mental health steering committee and is Mental Health First Aid qualified. She's spoken at the This Can Happen 2019 conference at the 02 (the largest mental health workplace conference), and met HRH the Duke of Cambridge for her work. And leads the PwC Muslim Network and is responsible for over 600 people across the UK and has been involved in advising clients on the implications of the government's consultation in ethnicity pay reporting. 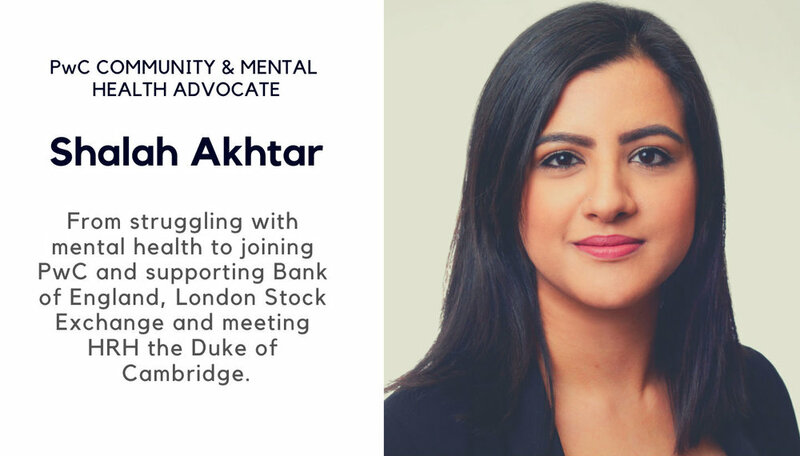 Furthermore, she helped set up a mental health community for those early in their city careers called, Thriving from the Start project with other leading organisations including Bank of England Linklater’s and the London Stock Exchange. Shalal aims to set a new market standard on how highly employee mental health should be valued. Mahad graduated from Queen Mary University of London and progressed to become a Maths Teacher. 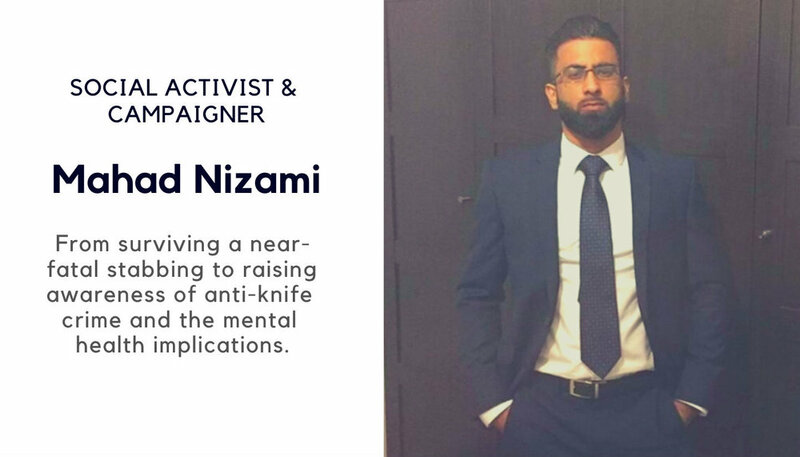 He's a survivor of a near-fatal stabbing, which in turn has made him passionate about raising awareness on gangs, anti-knife crime and how it all connects to mental health. The dream is to change mindsets and change lives. You will get a chance to speak to all of our speakers as they will take part in the discussions and support you with the interactive challenge. Thanks to PWC, teas, and coffees will be provided. We warmly welcome you to join us at this unique event, where you will collaborate with individuals, contribute your input, meet our speakers personally and connect with new people. Everyone is welcome, no matter the gender, background or religion and all proceeds going to a mental health charity.